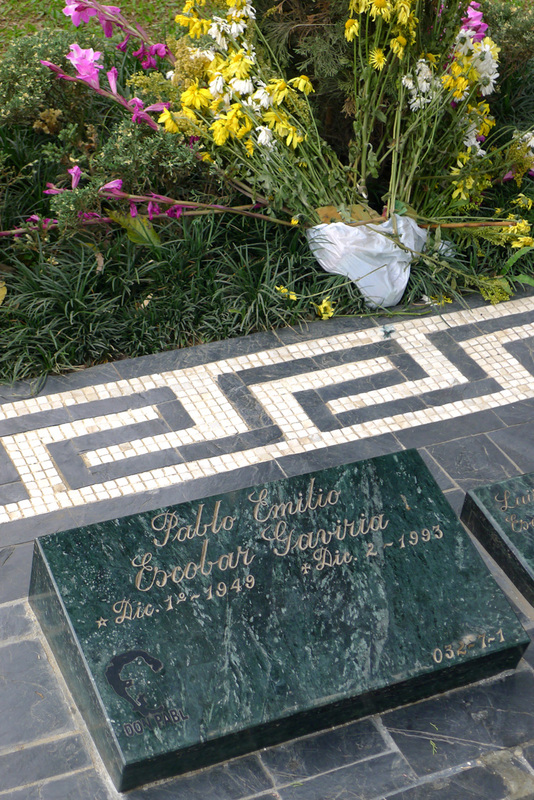 In Colombia, I trace the footsteps of the man, the myth, Pablo Escobar. For people here, the drug lord is either a saint or a demon. For travellers, the “cool outlaw” is a tourist attraction. My visit becomes a challenge, and attempt to understand and reconcile these extremes. Heading to Colombia from the Caribbean, the landscape around me changes, slowly but continuously. For fourteen hours, my bus follows narrow roads winding up and down hills. Towards the end, dramatic cliffs rise to my left and right and dense woods with scattered houses flash by. As we approach Medellín, the country’s second largest city, the reefs of vegetation are replaced by urban ones. Authentic ridges of slums, as far as the eye can see. As a first timer in South America, I have of course prepared myself for this city. But no theoretical background information has prepared me for this impressive sight, for this monumental scale and density. The “city of the eternal spring,” quiet and restless at the same time, greets me with soft winds, smiley people and its prominent shantytowns. When I went to university, the name Medellín was one often mentioned. I studied at the social sciences college where everyone had an opinion and the left hand definitely had a lot more weight. Of course, one of the great habits of the college’s raised fist intelligentsia was to enjoy the sun of Lisboa, sipping beers, puffing away and scrutinizing current world affairs. In the 1990s, Colombia’s name was often changed into Cocalombia. As a joke, yes, but also due to all the cartel wars blitzing the country. And, above all, it was due to one man who stood out and whose reputation crossed the Atlantic: Mr. Pablo Escobar, aka “El Patron,” aka “El Doctor,” or just simply “Pablito.” I remember well that in my college days, Mr. Escobar enjoyed great popularity and had sort of a fan club. The big question is: Why? Faustino, my first Medellín cab driver, has an answer: “Escobar should’ve been president of this country! He was the only one to help those in need!” To a lot of people in Medellín, “El Patron” is still a hero, despite his well known history of violence. “He killed a lot of people, people that stood in his way,” says Isabel, a Colombian college student I bumped into on the street. “But that was the only way… Good or bad, no politician helped the people like he did.” I try to understand. I try to see through her eyes. I need to find out more. 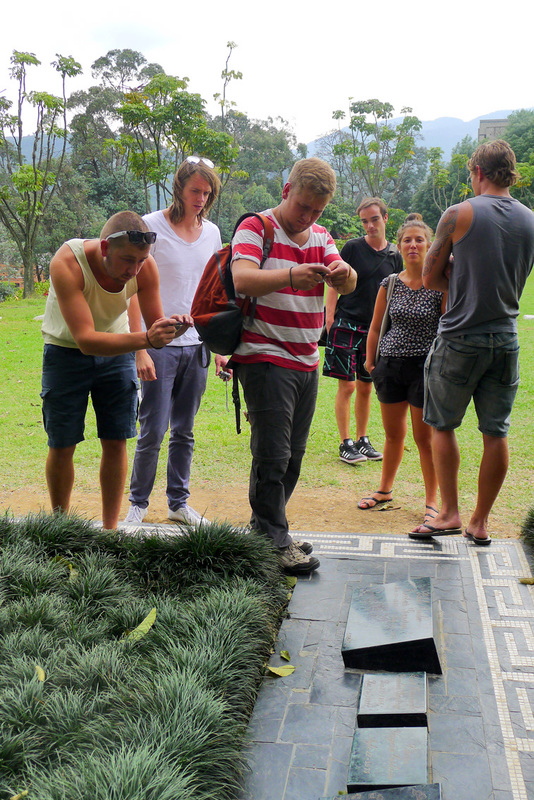 What’s Medellín like now, almost 20 years after Escobar’s hunting and killing by the police? How do people see him? What’s his legacy? Walking past a hostel in Poblado, what seems to me a higher class district of the city, I come across a noteworthy aspect of this legacy. A huge, golden poster announces in capital red letters: Pablo Escobar Tour. Looking at the poster, I have to pause for a second and rub my eyes. OK, so the man had more 20 dollar bills than the US Federal Reserve in the late 80s and was the first to import cocaine into the United States. Well, he also built an open air zoo at his house and chose his own prison, which included a nightclub. And yes, he was said to have ordered the murder of a soccer referee who didn’t help his team win a game. A myth of Colombia’s modern history! But does that make him a tourist attraction? The existence of the tour suggests that yes, and it seems to be very popular among travellers. But I can imagine that many Colombians might see it differently… I decide to do the tour the following day, not really knowing what to expect. Fernando, our beloved capitan, didn’t show up. We had arranged a pick up at 8, so we could buy supplies and sort immigration paperwork out. After some wait, our captain gets the dingy and looks for an alternative. Morning sunshine, basking out in the front deck, Caribbean view and all, having a read. Bliss. The dingy approaches and from the distant mumble, the only thing that startles me is the word “Paramilitary”. It turns out that everything is closed due to issues related to the paramilitary. Yes, after all we’re right on the edge of the Darien Gap, where guerrilla movements reign as they please. FARC was the first association, obviously. We decided to hit the town, to look for somewhere to eat, but what we found was a ghost town. Almost no one on the streets, and all the lively restaurants, bars and eateries shut down. After looking for a restaurant, I manage to talk to a local on the streets who makes a phone call: “Que quieres comer? Algo, no importa que!” After thinking a little bit, he simply nods and grunts “Sigueme!” And so we did, we followed him through the tortuous, dirt paved alleyways, away from the neatly painted walls of the shore. After five minutes walking and greeting some Sapzurrians, we reach a brick house where a plump severe looking old lady tells us to step right in. So we do, sending “Holas, buenas” to the whole family that was chilling on the front porch, or cooking. We are accommodated in the back yard, where a trash fire is burning furiously. Despite the intense smoke, we manage to hold on, I guess the appetite was too much of a reason to stay. We sat and talked, watched roosters eat eggs in what we, as a joke, called some kind of cannibalism. After 20 eternal minutes, our food arrived. Some kind of corn flour empanadas with a fried egg inside. Quite tasty actually, as long as you are patient and don’t burn your tongue on the oil drenched tortilla. We ate, we smiled, rejuvenated. This moment was something else. There are bad situations that prove to have amazing consequences. To be able to talk to locals, to experience their generosity, to eat the food that they eat is something that takes my traveling to another level. Muchas gracias, Dona Laura, for opening the doors of your home to some starving gringos. Can’t thank you enough. But the word paramilitary still echoed in my mind. I was still curious to know what was going on. I started inquiring with some locals, and the answers were quite vague, until I met Fernando, our boatman from the day before. He tells me that there is a strike, that’s why everything is closed. Smiling, he adds reassuring us: “Pero aca se esta tranquilo, no pasa nada!” After a while, I bumped into Andy, an English expatriate, based in Sapzurro for 18 years. He explained to me that the government bombed and killed a paramilitary leader, in a town further south. With the leader, several women and children were killed as well. It turns out that the people were actually striking, all around the towns in the north of Colombia. No transportation between major cities and villages, general services shut down. There seems to be quite a good deal of tension down in Turbo, another town. The question is, is the strike out of solidarity or are people just afraid of retaliation? Andy says that his place is not open only not to draw too much attention. Just that. Read between the lines. But he also tells me that the paramilitary groups were formed when land owners hired private gunmen to protect them from the guerrillas. With time they developed into a military faction of their own. Same story, different place, don’t you say? Dona Chila, the lady that sold us ice cream at her doorstep a few days before shed another light onto the situation. While handing me the homemade coffee flavored ice cream, she tells me that the strike was voluntary: “Hijo, esto es un paro de la gente, un paro pacifico”. Peaceful, voluntary demonstration or complying with the threats of some paramilitary group? It was a really stressful situation for the people. You could feel that things were not as smooth as normally. As for me, the simple fact is that I’m stranded here and I can’t sail today. Stranded might be a strong word, since there are many worst places to be stranded. Sipping a beer, being rocked to siesta by the waves of the Caribbean, laying down in a hammock is hardly a synonym for that word. It also gave me the opportunity to something I’ve been wanting since I first left home, to cross a national border on foot. Dilute that manmade line with my footsteps. It felt quite good… But the call of the road is stronger and I want to be on the move. Badly. And so you’re on a boat, crossing a national border. Not that you notice it, there aren’t many border checks in the Caribbean. “The easiest border crossing you’ll ever do!” Captain Dave said in his spontaneous optimistic smile. This premonition was not going to fulfill itself, unfortunately. My Colombia stamp was a hard earned bureaucratic prize shining on my passport. We did stop in an immigration spot in Panama but even the always vigilant bureaucracy must have its New Year’s break. This way, we had to sail into Sapzurro illegally, for all means. 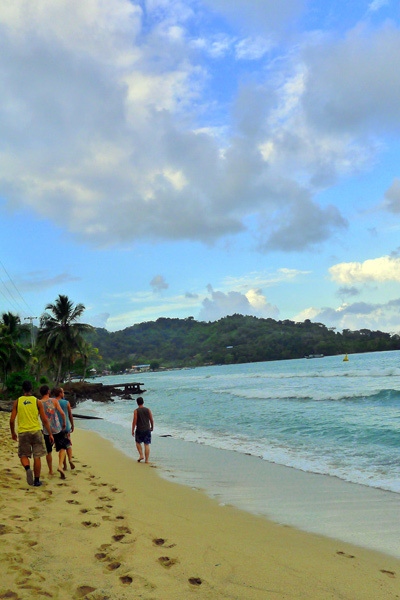 Twenty four hours of blissful illegal sunbathing and siestas in Colombia. Of course we had to sort this situation out. In the back of your mind always laid the slightly uncomfortable feeling of the machine gun armed cops asking for your papeles. After several rounds of negotiation, we managed to hire Fernando, a goofy looking self entitled capitan, that seemed to have his dreams of grandeur as a sea wolf. If Fernando’s air didn’t really inspire that much confidence, I almost lost all my color when I saw the noble vessel that was to take us back to Panama. 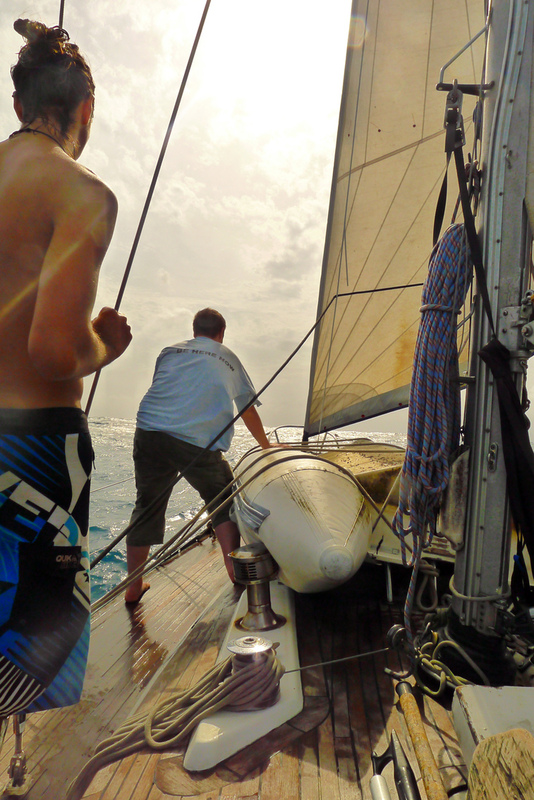 It was this narrow, wood made skiff, that shook even with the shy bay waves that petted our sailboat. “La Nina” was the name, maybe an ironic tribute to Colombus ship. I just had to ride it for 30 minutes, and the perspective didn’t look that exciting. All on board, 9 people plus the capitan. Fernando was directing everyone to their places, with a fantastic ability for weight estimating and I was immediately promoted to honorary translator. Everybody had their lifejackets on, hoping we were not gonna need them and the passports were well tucked in to your pockets. And off we go! 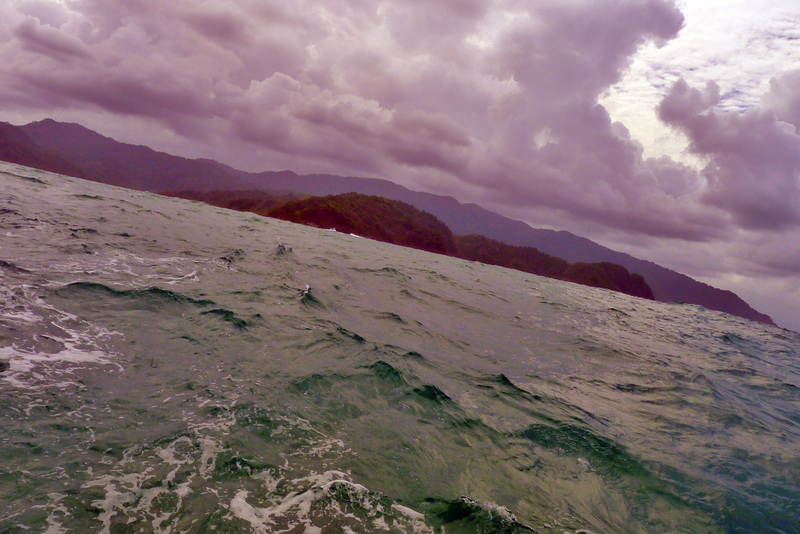 The first waves are easily crossed and only after we got into open waters the good fun started. “El mar esta muy picado!” Fernando warned us, letting us know something that we can easily perceive. He was actually laughing, not able to hide his excitement, showing his toothless grin everywhere he went. Long story short, the skiff almost flipped quite a few times. It was like a radical watersport, except I didn’t choose it. Every time we climbed a wave, Fernando’s fantastic mathematical skills were put into practice. “Amigo, go to the left, left I said! Hey, stick together you two, in the middle! !” As we passed Cabo Tiburon (Shark Cape), he also tried to enrich our knowledge about the local fauna assuring there were sharks while he did the sign of the cross – “Dios Mio! !” The idea of sharks passing by was not the most reassuring one, let’s put it like this. Panamian bureaucracy was quite a proud one. It seemed almost like if the officials were somehow excited about it.Well, not overly excited, a dense tranquility played the cards in Puerto Obaldia. Stress? I could never get stressed here. Tranquilo! Massive hangover is not good for sailing. That’s what common sense tells you, and you should always listen. But nevertheless we did “Hit the sea, Jack”. Surprisingly it was way better and a far more pleasant sail. The boat would glide through the waves this time, and you didn’t feel so much like you were riding a bronco. Ok, you’d still spend most of your time looking up to the main mast, laying down on the deck, occasionally being soaked by the invading waves. Yes, it would still be impossible to read a book, but it was way easier to do the stretch. Soon we had a dilemma. 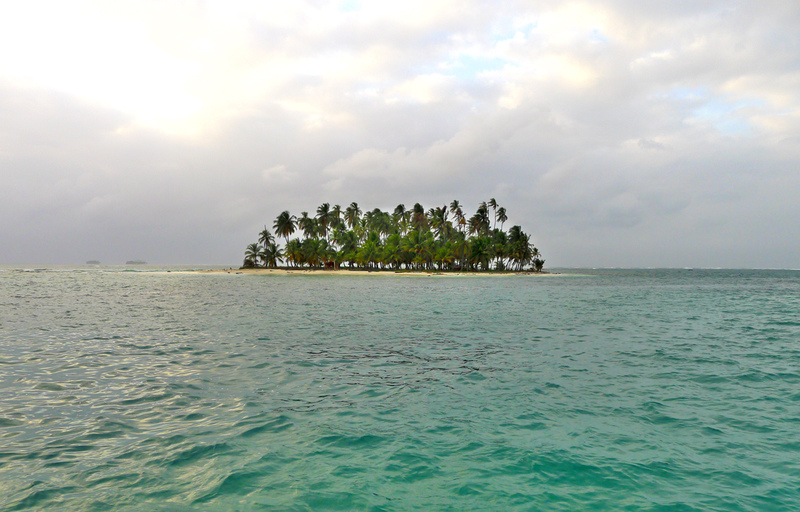 We could face the tortuous, wild waters of the Caribbean open waters, all the way to Cartagena, Colombia. Or we could simply head towards Sapzurro, a border town on the Colombian side. It seemed like the wisest thing to do, although it would cost us two extra days of traveling. The safe harbor of Sapzurro welcomed us, inviting the ship into its calm waters. The Caribbean jungle was present in all its splendor. Here nature was given creative freedom. Huge, dramatic reefs completely covered by vegetation. Man managed to carve out little place by the water, with a few scattered houses by the shore. I couldn’t help but feeling small. 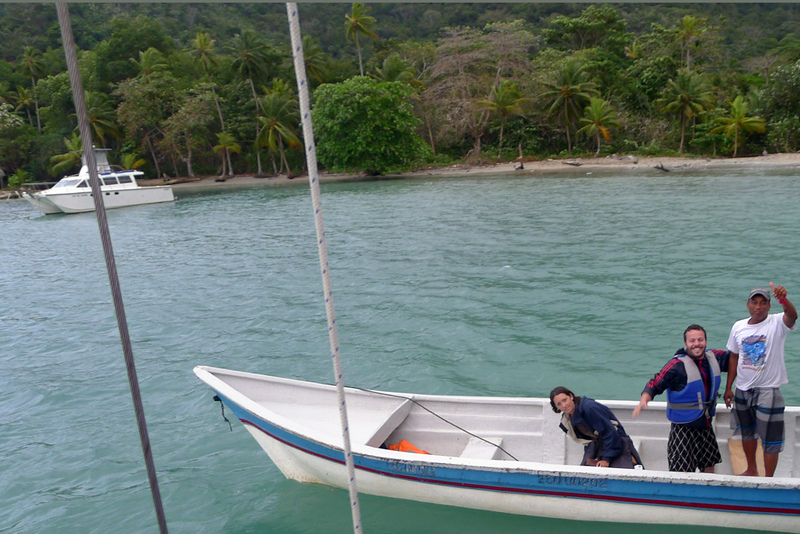 After all, we were at the edge of one of the world’s most unexplored places, the Darien Gap. I found myself gazing at massive wall of trees that laid ahead of me. Only a stretch of 160 kms, but no one has ever been able to tame this place. No roads, no cities, just wilderness in its purest form, only available to few. Lost in thoughts, wondering how gladly would I get lost here, the familiar sound of the anchor chain wakes me from my inner monologue. This wave of enchantment didn’t last long. Like every border town, Sapzurro and its people have the interesting habit of always trying to get the tourist. When you’re already a stranger, these local practices don’t necessarily make it easier to blend in. In my crooked Spanish beers cost would cost me 500 pesos less. Just ten minutes later, it’d cost me the tourist price. I just looked at the old lady, smile at her and she would just shrug her shoulders and smile back. A mutual understanding arose, I just thought “wherever there are tourists passing by, I guess that’s the consequence”. I guess having withdrawal symptoms from land did have a major effect on Sapzurro’s first impact. Once a gringo, always a gringo, right? But this lovely little town still had quite a few surprises for me, some that would change my mind. During the first day, waves of three to four meters blessed our route, making what would be a “cradle rocking” movement into something that felt like a drunken tribal drumbeat. Most of my day was spent horizontally, in a deep slumber, with the implacable Caribbean sun blazing through the fairness of my skin. My stomach felt like Speedy Gonzalez was playing Dixieland Jazz with Pablo Picasso as a conductor. All the food intake quickly splashed into the turquoise waters that laid below. I just gave up, simply dozing out, eyes closed, so the points of reference wouldn’t rumba all around me. “Yeah, it’s kind of rough out there, hey?” Dave, the captain said in his thick Aussie accent. He still smiled and acted like it was nothing. All of us passengers laid in the upper deck, scattered around just as if the Black Plague had suddenly struck. Inside the boat, coordinated movement was impossible, as the risk of falling over the dishes was too high. 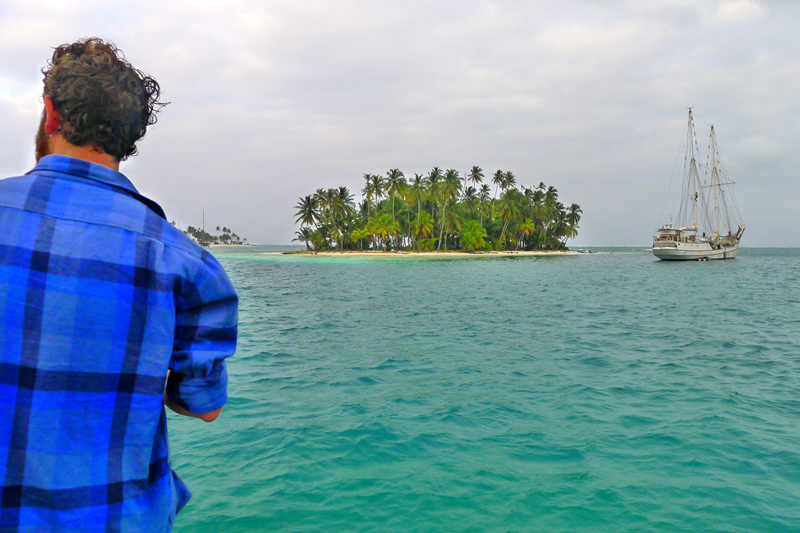 And so we ended up walking around the islands and consuming loads of rum around our New Year’s Eve bonfire. Along with plenty of Italian and Cuban families and some of the native Kunas that always wanted you to buy weed. Fortunately they also had lobster, which was great. It ended up being a fantastic New Year’s Eve. An unusual sense of communion arising between Australians, Kiwis, Norwegians, Swedish, Dutch, Canadians and Portuguese. Everybody knew each other for just about a day. But our first day of the sea, everybody’s “maiden voyage” made the sense of belonging stronger and stronger. Of course the rum did help. 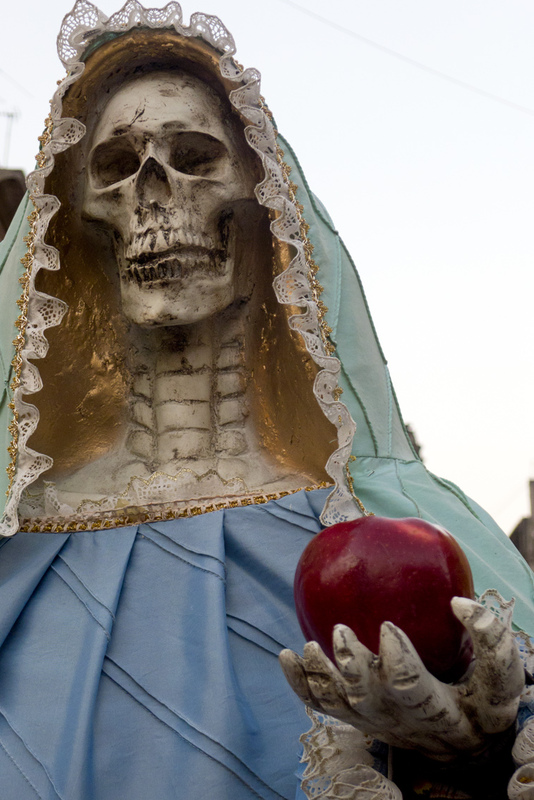 Taking a walk in Mexico City to observe the living, I end up chasing death. I love to walk. I see it almost as a spiritual ritual that makes me feel a bit like a people-watching pilgrim. During my many walks in Mexico City, I stumbled across a phenomenon so intriguing that it turned me from a pilgrim into a detective. Fighting my way through the usual crowds, I pass by the Sonora market and notice what looks like a Christian altar dedicated to a veiled saint. Nothing extraordinary for me, after all I grew up in a Catholic country where saints are ubiquitous. I sneak a look at the figure’s face and am completely caught off guard when I realize it is a skull! Is this the grim reaper hiding underneath the white veil covering the Virgin Mary in my grandparents’ town? I leave the church and follow the market road, seeing people toiling, working hard to make a living. 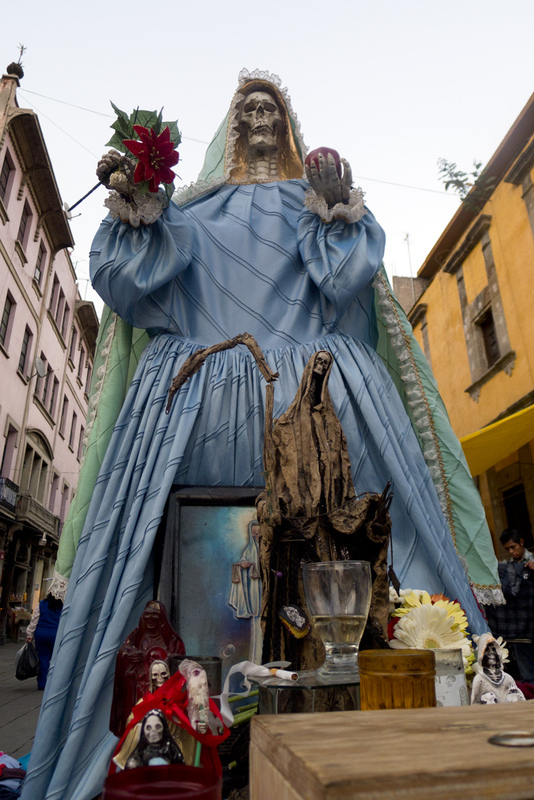 If life works you like a boxer works a punching bag, it is no wonder people turn to Santa Muerte. Maybe the combination of both light and darkness, of life and death forces will get you through another day. You just have to have faith.